How do I connect a printer via Bluetooth? Tap the Menu icon in the top-left corner to go to open the navigation bar. You will now be presented with the Bluetooth Readers Tap on the Pair a New Reader button. RPX5 will prompt you to select the type of reader/printer that you wish to connect. 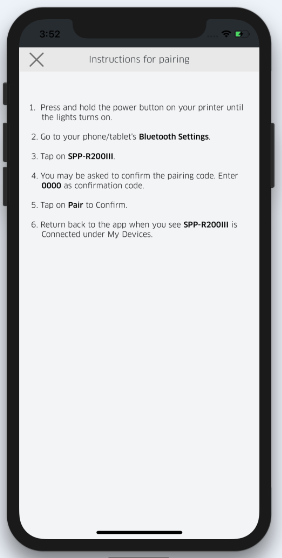 If you are pairing a Bixolon SPP-R200III Bluetooth Printer, tap the corresponding image. You should be prompted with a screen providing the following instructions to pair the reader. Navigate to your device’s Bluetooth settings, and select the appropriate device (corresponding to the printer you wish to connect) via Bluetooth. At this point, the reader should be successfully paired with the device, and you will see a notification as displayed below, directing you back to the RPX5 application. Navigate back to the RPX5 application. The printer will now show up in the Paired Readers list as connected, and you will be able to begin using the printer. For additional support, please refer to the Support Page in your merchant portal or contact your ISO administrator.